Wes Ellis: Hell: Wrath for Restoration? Spring break is finally here… well right after my next class. I don’t know how much bloging I’ll be doing down in San Diego so my posts may be scarce through this next week. Does God ever do anything destructive without the intention of reconstruction? In other words why does God punish? Does He punish simply because of wrongdoing or does He punish to make the world a better place? For example; why did God send the flood? Was it really just to destroy or was it to restore? Is God’s wrath for restoration? So this leads into the real question. What is Hell? 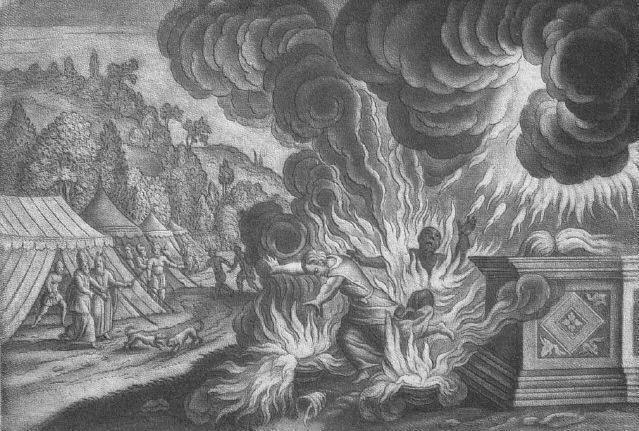 Is Hell just for God’s wrath or is it for restoration? Is Hell wrath for restoration? You're not really equating the flood, an EVENT, with hell, an EXISTENCE, are you? It's the principal I'm getting at. I mean not to equate the flood with hell in any other sense than that God made it happen. God has something to do with Hell. Hell is a realm or "an existence" I understand that. No offense dan but you have once again managed to completely miss my point. All I'm asking is why does hell exist? I think it may go beyond the whole "God is just" thing. I think certainly the flood happened because of justice but it goes beyond that. He sent the flood to restore the world... at least that's what I get out of my bible. It also seems throughout scripture that anywhere God's wrath shows up His plan for restoration shows up. He sent plagues on Pharoh out of justice and also to free His people. Hell, I think, may go deeper as well. It's purpose may also be restorative. We may be reading very different bibles. I think you read yours with too great a 20th century influence. It's called hermaneutics. We have to identify the lense through which we see the bible. Our concepts of hell are more grounded in modern theology than in scriptural exegesis. The bible doesn't talk a whole lot about hell. And out of the twelve or so times Jesus talks about it it's only referred to once in reference to someone's life after death. Do your homework before you decide to be so insulting. I challenge you to read some non-fundamentalist literature on the doctrine of hell. I'm not offended at all - honest. As I said before, asking questions is fine - until these grand questions of our tip toe PAST what is clearly stated in scripture. Faith is - FAITH. LOL... how's THAT for a bumper sticker? We either believe what the Bible says or we don't. It's not a matter of not being allowed to question - it's a matter of maintaining a foundational belief in what the Word of God teaches, reveals and models. You have posed a thought provoking one here. My mind immediately goes to the final destruction in Revelation. But even that brings about a "new Jerusalem." BTW, I could use a little fun in the sun too! Wes, I've never heard that hell is for restoration before, but that doesn't mean it's wrong (in fact maybe the opposite is true!). I like having my mind stretched to new dimensions. I really appreciate what you said in your comment: "Our concepts of hell are more grounded in modern theology than in scriptural exegesis." To that I'd have to quote Uncle Rico - "Right on . . . Right on." Great answer. At this point it's my best answer too. What are you refering to? What have I said that contradicts scripture? Scripture isn't all that clear on the purpose of hell. It implies that it exists for those who aren't in harmony with God in some way or another... even what is clear isn't all that clear. My question is what is that all about? Why? Is it simply to destroy people or is it to restore creation? I like having my mind stretched too. this question is definately doing that for me. Try this: Re-read some scripture that mentions hell with this concept of restoration in the back of your mind. It's very interesting. That's a great thought. I wasn't thinking of that verse in this context but it makes alot of sense. Thanks. As I understand scripture - I will either live a life WITH God ("heaven") or I will live a life totally separated FROM God ("hell") - to ponder the idea that hell "could be" a place of restoration makes no sense from a Biblical standpoint. Because this infers - by the very use of the word "restoration" - that one might learn something or alter their relationship with God after having been IN hell - and then what? Move on to heaven? Hell is a final destination - it is not "one stop along the way." In this regard, it is nothing like the flood at all - it cannot even be compared to the flood since the two are as distant from each other as night and day. Expaning our thinking can be fun and entertaining - but when we expand our thinking to that which lies outside the borders of what the Bible teaches - and then adopt these "new thoughts" as "truth" - we have stepped over a line that God is not pleased with. I know what you are getting at. I believe in Christ's diety and resurrection but this concept of hell which has been influenced by pagan sources and then the Roman Church and fundamentalism to put people in fear and control. There is something wrong with this. God delighting in someone burning in hell forever. What kind of God is this? Don't get me wrong. I'm not a convinced universalist but I see Reconciliation and restoraction as Christ's work not eternal damnation. BTW Wes. are you almost a Senior in seminary? I don't think you understood my question to begin with. Our dispute is based on misunderstanding. I never meant to say that hell was a place of restoration or that it was a "stop along the way." I never infered that. I agree that it is eternal damnation. To go back to the flood idea; the people who died in the flood stayed dead but through the flood restoration came. They were not restored, were they? What if hell is the same. The people who experience hell after death are not the ones being restored, they stay dead. But what if their punnishment is restorative for the world. I think you'd agree that hell has to exist for things to be made right. That's what I'm getting at. I'm just trying to get to the deeper meaning of that; beyiond the overstated "God is just so He has to" argument. Does my "why hell" question make more sense now? Our disagreement may be more based on misunderstanding than biblical interperatation. I wouldn't think of you as a universalist. I understand your thinking, it sounds alot like mine. That's why I'm studying hell. I think that it has to exist for restoration if God is sending people there. I almost wish universalism was right sometimes but I'm sure it isn't. Christ work is restoration, we agree. So how the heck does hell fit into that? That's what I'm after in this study I'm starting next semester. I am actually still getting a Bachelors in Theology. I'm almost a junior. BTW It's good to have your comment. Thanks. Are you going to be pastor? There's a good chance! I also want to teach church history. Yes, I know. My friends and I have been trequesting him all semester.